Drove around this morning for an hour trying to find an estate sale on the 17-mile-drive. Only “I” could possibly drive 17 miles to end up back where I started. Being lost in Pebble Beach is not such a bad thing, but sadly, I never found the estate sale, so decided to head up north to go junking in a little town called Soquel. 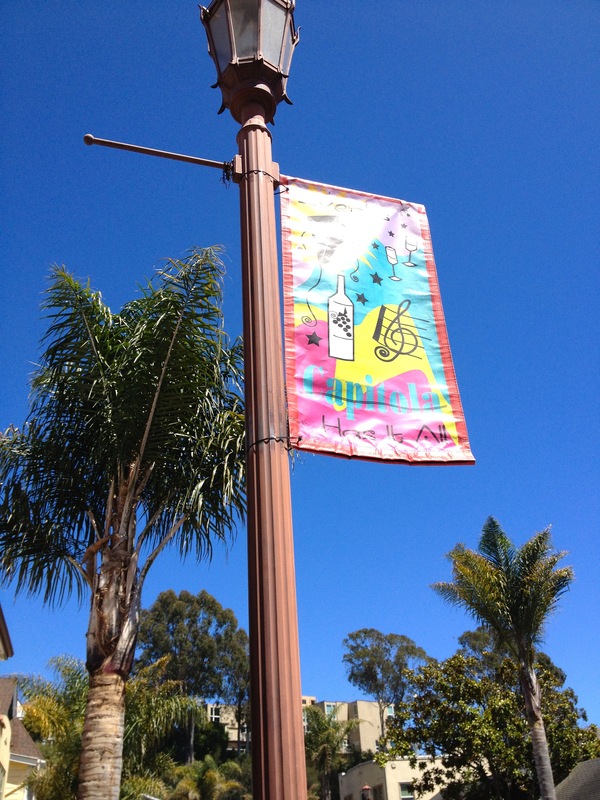 Soquel is a 45 minute drive from Carmel. You will pass Moss Landing where there is a boat harbor and a Mexican restaurant that I always want to stop at, but never do, called “The Whole Enchilada.” I crave Mexican food, as there is not a one in Carmel. Trying to talk a friend of mine who once was a famous restaurateur in Monterey to open one in Carmel with a salsa bar, great margaritas and a festive décor. Hopefully one will emerge soon, as my cravings for spicy nachos grows by the day. Antiques are what visitors go to Soquel to find. There are 8 shops there but prices are high. My favorites are Center Street Antiques, Trader’s Emporium and a vintage but uber chic garden shop called the Potager. The Potager has only been open for a season. Airy and simplistic garden décor, offering vintage tools, potting benches, plants and packets of seeds. It makes you want to work in your garden or at least fill your kitchen with something from this memorable store. The owner is so naturally friendly and is happy in her surroundings, which makes you feel comfortable being in her space. 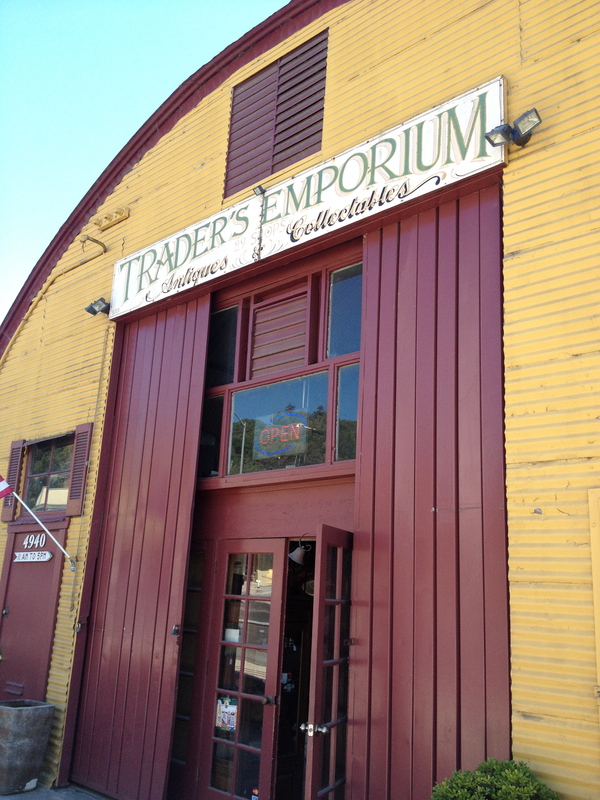 Trader’s Emporium has a mix of everything from military to mid-century. I particularly love a book titled, “How to Cook a Wolf.” Books are very pricey in this emporium, but find most things are negotiable and fairly competitive in price. 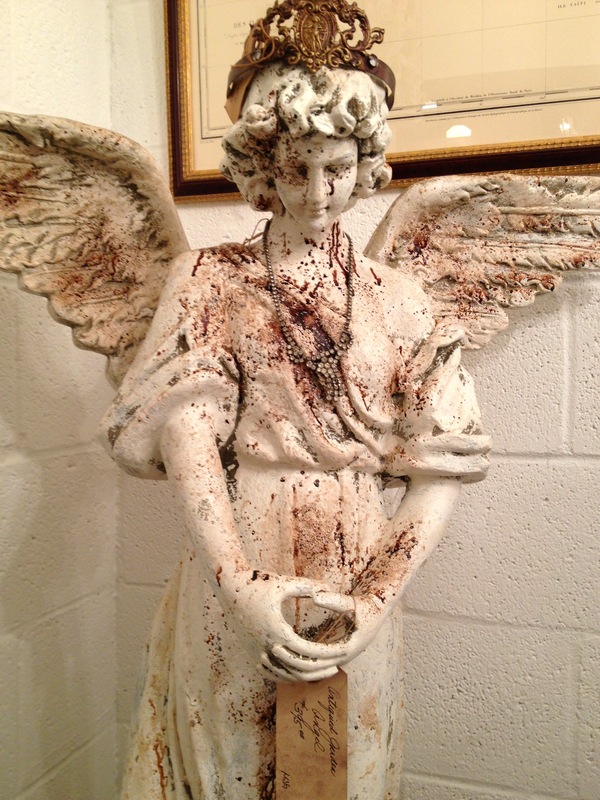 Two very nice men help me carry my purchases back to my vehicle, as I walk out with a vintage Hendryx birdcage painted red, a chalkware religious statue, a pair of pottery butterfly sconces with amazing Bakelite fixtures, and military collectibles. I am thinking now that I shouldn’t have passed up the old wooden panels for $12 each, as I could have repurposed them with glass knobs screwed in to convert them to hat racks. Across the street is Center Street Antiques, housing a mixture of different dealers who have great style for boutiqueing each of their spaces. I spot these pedestals flanking the doorway that are rolled up rusted fencing with a round wooden base on top. Very cool idea, probably costing less than $10 to combine, now priced at $169 for the pair. There are piles of canvas & burlap pillows with French stenciling, stone fountains & garden pieces, a room of religious statuary and metal crowns (my weakness), and probably the most fabulous architectural wooden panels I have ever encountered. They are $595, so not in the budget for today. I point out all the things I am interested in to one of the girls, and ask her to call the different dealers for their “best prices,” while I leave to drive a few blocks away to Capitola-by-the-Sea for lunch and a glass (or two) of wine. I walk on the esplanade until I come to the beach. It’s like Laguna on steroids. A hundred colorful beach umbrellas, with families and kids and people of all ages, reveling in the salt air and surf. I decide to try Zelda’s. Outside on the deck overlooking the beach, somehow my glass of white wine from a local vineyard in Soquel, tastes especially good. The waiter suggests the calamari, a specialty of theirs. It arrives in a red plastic basket with wax paper, ala burger-joint style, with two sauces. One a cocktail sauce, the other an aioli. Two-inch strips of soft fresh calamari steak in a light fried batter, melt in your mouth, sans the little alien-like tenacle parts. I eat the entire basket. What a great way to have spent a Saturday. Driving back to Carmel with windows open, shazamming great tunes on Sirius radio, I reflect back on my day, and if there was anything I should not have left behind. Should have sprung the $24 for the “How to Cook a Wolf” book, and should have just “gone for it” and distracted the gallery gal to sneak a pic of those fish silhouettes. Need to return one day soon for the $12 wooden panels, and already craving the calamari, happy that I never did find that estate sale in Pebble.